Intelligent Defog feature Improves visibility when viewing foggy or other low-contrast scenes. Recording capacity 16GB of internal EMMC-based memory. 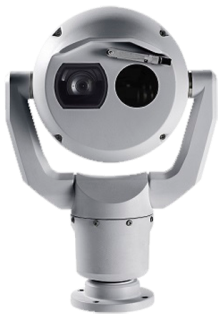 Provides local recording for minimum of 4 hours that includes continuous recording at maximum fps of both visible and thermal image streams, metadata, and audio. Redundant configuration Connect both High PoE Midspan and a separate 24 VAC power source. If either the High PoE or 24 VAC power source fails, the camera seamlessly transitions over to use the remaining power source. Accessory Interface/Control Data RS-485, Simplex, half and full duplex, user-selectable baud rate or auto-baud Used to communicate with optional Alarm/washer interface box (MIC-ALM-WAS-24) or with Bosch OSRD, Pelco P/D, Forward Vision, and Cohu serial protocols. Color Grey (RAL 7001) Available in specific regions only.